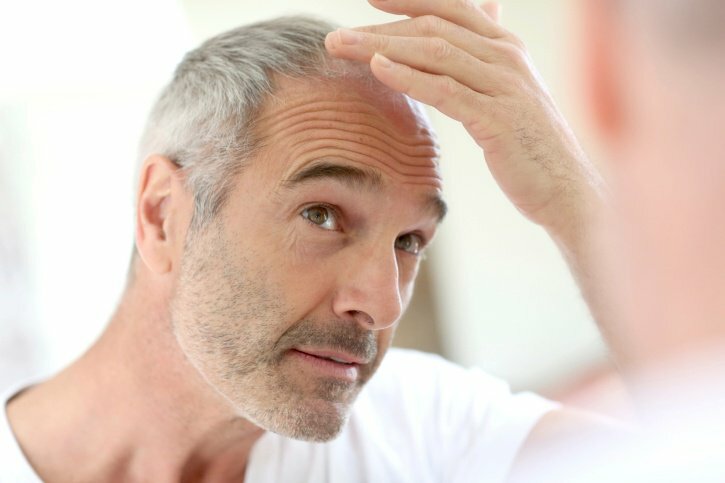 Home › Articles › What's Better for a Balding Man: Long or Short Hair? What's Better for a Balding Man: Long or Short Hair? Hair loss is a condition that affects most men during their lives. Despite the fact that nearly all men deal with it, though, it is a difficult thing for many. Millions of dollars are spent every year to disguise and treat hair loss in men, but how effective are most of these remedies? There are some things that can be done to help the problem of hair loss. Unlike many of the products that promise a fast cure and don't deliver, these natural treatments often lead to gradual improvement with continued use over time. Virgin coconut oil has several positive effects on the hair and scalp that make it a promising treatment for balding men. Because it can penetrate hair follicles and release its beneficial vitamins and antioxidants, it can create optimal conditions for hair to regrow. Coconut oil also has gentle exfoliating properties which clear away dead skin cells and allow new, healthier ones to develop. Another positive benefit to virgin coconut oil is that it can slip into the hair shaft, hydrating hair and causing it to appear thicker and fuller. While the scalp is gradually healing so that it can produce new hair, the thickness of existing hair is maximized. Of all the drug-based therapies for hair loss, only minoxidil has shown any documented results. If your doctor suggests this treatment, using virgin coconut oil can increase its effectiveness and keep hair healthy and hydrated. Biconi has a natural line of hair care products that contain virgin coconut oil and plant extracts including noni, a Polynesian fruit that has many healing effects on skin. Hair Rejuvenating Solid Shampoo and Hair Repair Conditioner contain all the necessary ingredients to encourage hair regrowth and healthier looking hair. As hair and scalp heal and get back to growing hair, men may wonder how to style their hair while they wait. What kind of hairstyle looks best for a man with some degree of hair loss? The general rule is that shorter hair is more attractive and tends to be more effective at camouflaging hair loss. Many balding men just decide to shave it all off or sport a buzz cut. Others grow a mustache and beard but leave the top bare. Sometimes if the hair loss is minor, a cut with shaggy layers can give a little more length without drawing attention to the condition. The one universal rule concerning hairstyles for men with hair loss is to never under any circumstances try the comb-over. It doesn't matter how long hair is, a comb-over only serves to draw more attention to the problem and is universally considered unattractive. Men who enjoy having longer hair can work with a hairstylist to find the most attractive longer hairstyle for their hair while they wait for hair regrowth to take hold. After all, hair loss is a very common condition that almost all men deal with. Although it can be very upsetting, it shouldn't stop men from styling their hair in the way that makes them happy.